Stair Lifts offer security and independence to people with mobility issues. They allow for personal freedom, meaning people can maintain a regular lifestyle in their homes. Buying a stair lift is a big decision. 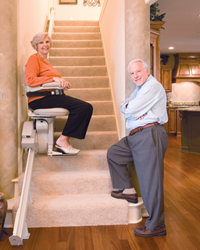 It’s good to gather information and understand what goes into having a stair lift in the home. The first thing to know is that there are many models of stair lifts. They have different styles, sizes and abilities to perfectly match the needs in your home. There are stair lifts designed to work with straight stair cases. Other stair lifts are designed to work with curved stair cases. Smaller stair lifts can be used for a smaller, slender person. The room needed for these stair lefts is less compared to other models. There are larger stair lifts that can handle more weight and stair lifts designed to work outdoors. You might be wondering if a stair lift in your home will be a major strain on your electric bill. The truth is, most stair lifts run on battery power. The batteries typically last 2-3 years. Batteries are automatically charged when the chair is parked at the top or bottom of the stairs. The battery charge plugs into a standard wall outlet. It terms of installation, the stair lifts are fixed to a rail that attaches directly to the stair treads. The rail can be attached to hardwood, carpeted or concrete stairs. The stair lifts are installed by a trained technician. This is a must in order to maintain the warranty.